Here we show how to write an advanced ant task that search inside a FileSet , and that can return found files giving their path, relative to a given base path. then we improve the task by managing relative paths. At the end you can download all source code as a zipped project. Suppose you want to write a task that search for a filename, over a large set of files. Ant provides <fileset/> to represent a collection of files. So, to follow standards, your task should looks like the following. 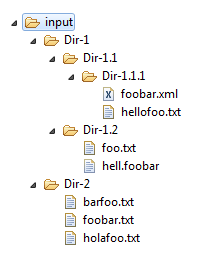 in my idea the <my-advanced-task/> search for files whose contain “foobar” in the name, and write the list of matching files into the “found.list” ant property. Note, the Vector filesets, allow to add more than one fileset to your task. Now we can write the execute() method, that make a search on the Vector of filesets added. Now we add a small improvement to the avdanced task. We want that the output file list is relativized with respect to a given basepath. We add a property and its setters. The execute method now, take into account the new basepath and, if it is defined, use the method File.toURI().relativize(.) to get relative path. If the basepath is not defined, we want the same old behaviour. Note, we mantain the old behaviour if the basepath is not defined.